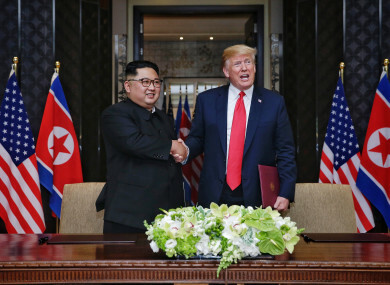 DONALD TRUMP ACCEPTED an invitation from Kim Jong Un to visit North Korea during their historic summit, Pyongyang state media reported today, as the US president said the world had jumped back from the brink of “nuclear catastrophe”. Yesterday’s unprecedented encounter in Singapore saw the leader of the world’s most powerful democracy shake hands with Kim, the third generation scion of a dynastic dictatorship, as they stood as equals in front of their nations’ flags. Email “Trump hails summit with Kim: 'The World has taken a big step back from potential Nuclear catastrophe!'”. Feedback on “Trump hails summit with Kim: 'The World has taken a big step back from potential Nuclear catastrophe! '”.